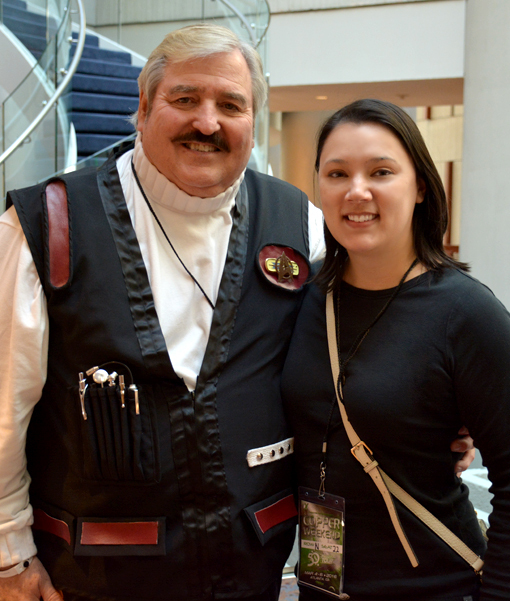 That's my friend Nikki with "Scotty" (pictured above), a cosplayer I've seen many, many times at Dragon Con. 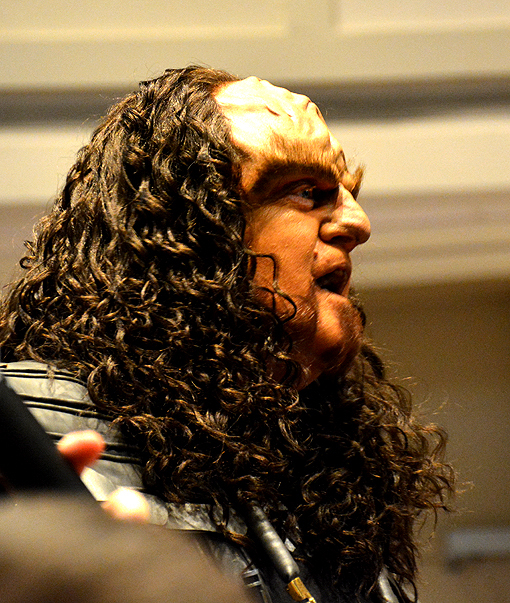 It was great to see him and many other fellow Star Trek fans at the Creation Entertainment's 50 Year Mission Tour, a touring convention celebrating 50 years of Star Trek and a three-day event in Atlanta at the Westin Peachtree Plaza Hotel. Scotty was one of the top three finalists in the costume contest on Saturday! The headliners at this particular convention were William Shatner (Captain James T. Kirk, Star Trek: The Original Series), Gates McFadden (Dr. Beverly Crusher, Star Trek: The Next Generation); Jonathan Frakes (William T. Riker, Star Trek: The Next Generation); and Michael Dorn (Worf, Star Trek: The Next Generatation & Deep Space Nine). Obviously (photo above) I got an autograph from Gates and also got one from Dominic Keating (Lt. Malcom Reed, Star Trek: Voyager) and the lovely Chase Masterson (Leeta, Star Trek: Deep Space Nine). Thanks to Atlanta offering so many celebrity spotting opportunities, my collection of autographs is growing exponentially! By the way, William Shatner has confirmed that he will be at Dragon Con 2016! 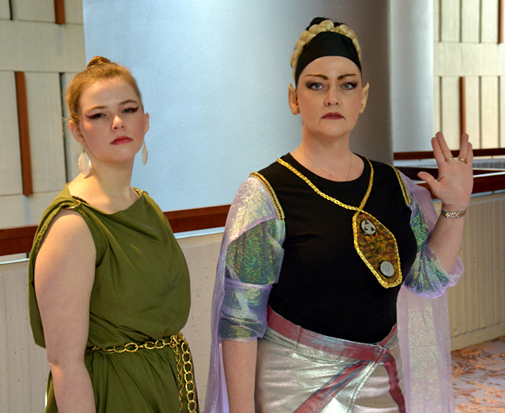 It wouldn't be a Star Trek convention without a costume contest...seriously, it just wouldn't! 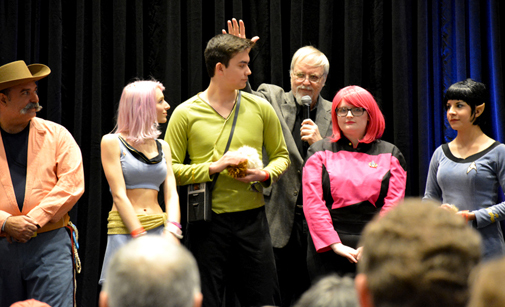 There were some excellent entries, including Mudd, original series Captain Kirk and "Pink Trekkie". 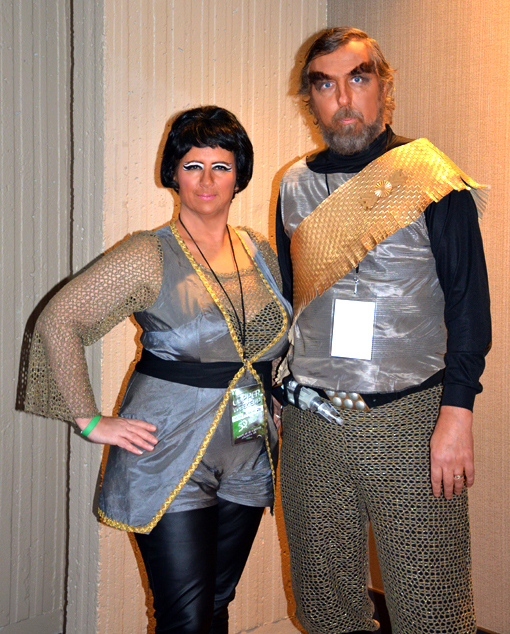 As I mentioned, Scotty was one of the three finalists in the contest, as were Mudd & companion and an original series Klingon couple. Thank you to all the entrants and congrats to the winners! Chase Masterson is incredibly sweet and charming! She was the first celebrity I met at this convention...and a delightful surprise! 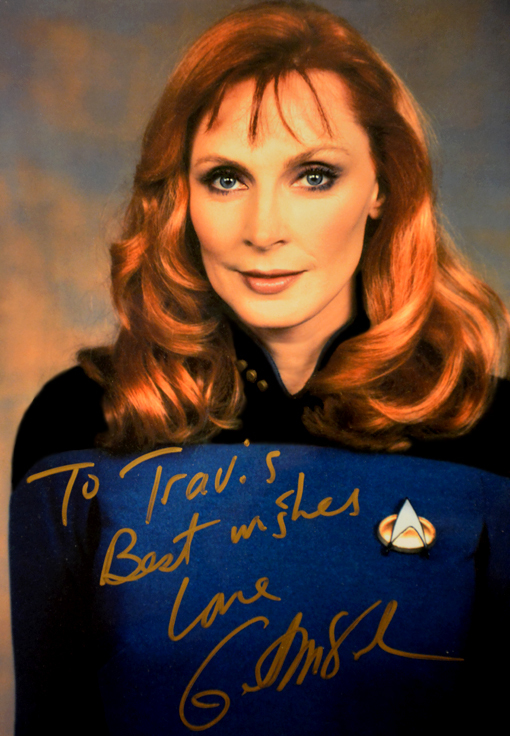 I got an autographed headshot—one of her has Leeta in Star Trek: Deep Space Nine—and I also got a copy of her music CD, Jazz Cocktail. I listened to it while having dinner Friday night...it's wonderful! The following morning, Chase was the first speaker and she treated us to a live performance of a couple of numbers from the CD! 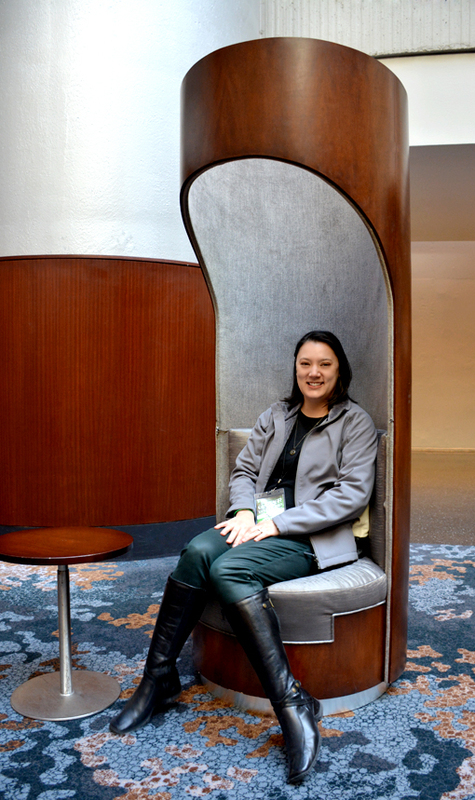 Nikki taking a break between programs...the seat spins! 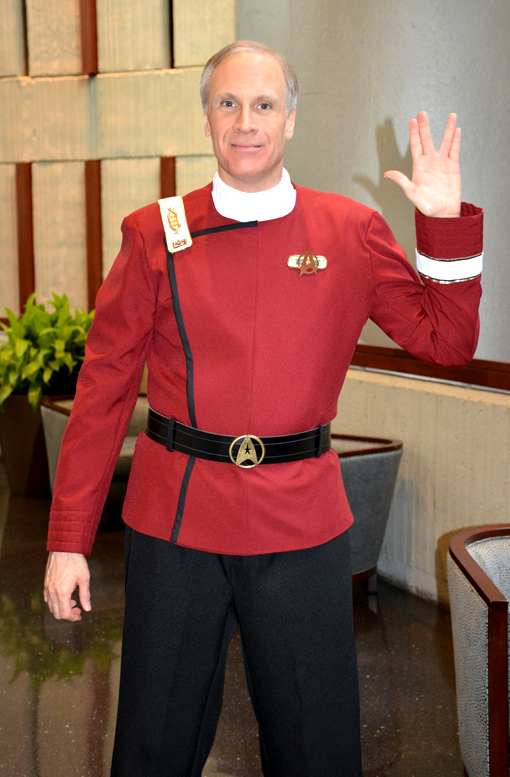 I took Friday off work so that I could attend the three-day Star Trek convention. On the way home on Thursday night, I stopped for tacos (not saying where). I chipped a tooth on a crunchy taco (I almost always have soft tacos), that wasn't all that crunchy! It was actually bonding that chipped...a childhood sibling argument left my two front teeth chipped, so I've had bonding for many, many years. I freaked out for a minute—knowing that I'd have to meet Captain Kirk and Dr. Beverly Crusher with a chipped tooth...and then realized there was nothing I could do until Monday, without sacrificing the Friday of the convention...and that wasn't happening! It was a minor, hardly noticeable chip. So...chipped tooth, three days of Star Trek convention, AND I saw a play on Friday night ("The Revolutionists" at 7 Stages...it's AMAZING, and I'll write about it soon), and I attended the Allie Awards (the Oscar's of Atlanta's event making world) on Sunday at Georgia Aquarium, and then went to the dentist on Monday morning arriving at work shortly after 9am. Are you tired? Because I was, come Monday night! On Saturday, after the main programming of the convention, Nikki and I went to the Sun Dial Restaurant, Bar & View, specifically the bar (which does a complete revolution in only 35 minutes). 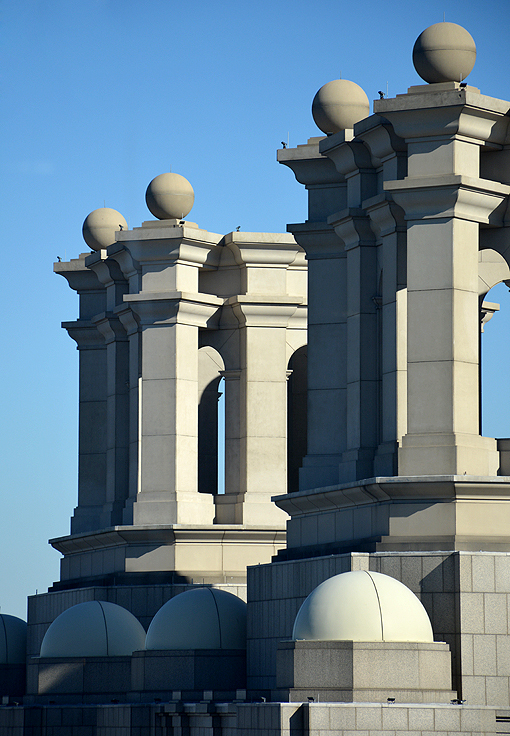 The view is magnificent...it's pretty amazing to see the double crown of the One Ninety One Peachtree Tower so closely from the 72nd floor of the Westin! My friend David, who was the best Superman at Dragon Con 2015, joined us and we all later went to dinner and talked all things Star Trek, cinema and superhero...good times! 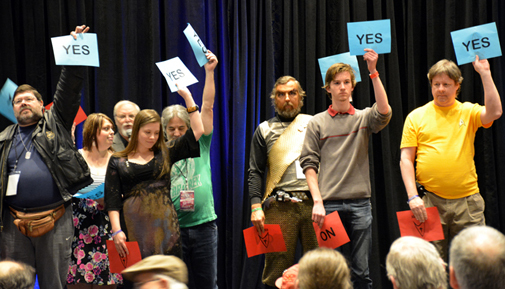 These folks were sitting in front of us during the convention (we had reserved seating!). They're characters from Star Trek: The Original Series. If you've never watched Star Trek, the absence of forehead ridges comes up a number of times throughout the franchise...as does the fact that Klingon's don't like to talk about that time in their history! I love how a simple hand gesture has permeated our culture and how it immediately identifies the fact that someone is a Star Trek fan. I had the great honor of meeting Leonard Nimoy in 2002 when I lived in Washington, D.C. He was speaking at the National Press Club, presenting his new photography book, Shekhina. Although the book was not about Star Trek, he generously shared with us the origin of the Vulcan Salute and the accompanying greeting "Live long and prosper". I got to be on the convention stage! There was a trivia contest and all attendees were invited to participate. I made it through three questions before I missed a question from the 2009 Star Trek film. It was great fun! Thanks for reading...this post was merely to share some fun and to remind everyone that you should totally keep an eye on what's happening in Atlanta so that YOU don't miss an event that speaks to your particular brand of fandom. Follow your favorite tourist attractions and destinations on social media and/or subscribe to their email lists, whether it's a convention like Dragon Con or whatever...just make sure you get out there and enjoy as much as possible of what Atlanta has to offer, which is a LOT! Sea Lions, Dolphins, Penguins and So Much More! Atlanta Ballet's "20/20: Visionary" is Powerful! Heads Will Roll...and You're Gonna Laugh!